Editor's note: Test results revealed in November 2007 in an issue of the medical journal "Cancer" show that the harmless radio waves described below were used to kill liver tumors in rabbits with a 100 percent success rate and without side effects. To see a summary of the latest results, click here. For most, a cancer diagnosis can be devastating. But, as CBS News contributor Benno Schmidt reported on The Early Show Monday, for John Kanzius, it was a call to action. Kanzius isn't a doctor. He doesn't even have a college degree. Yet, observes Schmidt, the device he invented has impressed a notable researcher and inspired his hometown, Erie, Pa., to the point where it gave him a key to the city in April. Asked by Schmidt what made him think he could cure cancer, Kanzius replied with a laugh, "What made me think I couldn't cure cancer? Nobody else was doing it!" A former radio and TV engineer and one-time station owner, Kanzius, who suffers from leukemia, hated his chemotherapy and saw its devastating effect on others. "I ran into some of the same patients over and over again and, to see their smiles disappear within a few weeks, and then watch their hair disappear and then, clinging to their mothers asking, 'What's wrong with me?' was heartbreaking." Kanzius, who'd been building radios since childhood, believed radio waves could somehow be harnessed to destroy cancer, without drugs or invasive surgery. "I envision this treatment taking no more than a couple of minutes or so," he says. Kanzius hopes cancer treatments could work something like this: A patient would be injected with tiny metal nano-particles, which would be carried through the bloodstream by a targeting molecule and attach only to cancerous cells. The patient would then be exposed to an energy field created by radio waves, and feel nothing, while the nano-particles would generate enough heat to destroy their cancerous host cell. While noting that targeting cancer cells will be the biggest challenge, Kanzius demonstrated just how easily the nano-particles could be used as receivers. A lab worker injected carbon nano-particles into a specific spot in a piece of liver, which was then placed into an energy field of low frequency radio waves. Within seconds, the areas injected the with nano-particles were heated to the point of actually cooking the liver, while leaving the surrounding meat unscathed. Kanzius' invention has caught the attention of Dr. Steven Curley, a surgical oncologist and cancer researcher at MD Anderson Cancer Center in Houston. "This has the most fascinating potential I've seen in anything in my twenty years of cancer research," Curley told Schmidt. Curley has developed current methods of using radio frequencies to attack cancer, but says he looks forward to one day using a non-invasive approach like the one Kanzius is working on. 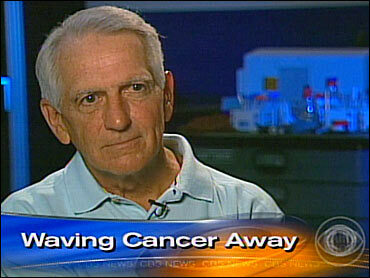 "This," Curley says, "is what will get into the cancer cells and again … release heat that will kill the cancer cells." He wouldn't reveal animal test results on camera, but says he's optimistic that his findings will be announced this fall. In the meantime, he's joined Kanzius in an effort to raise awareness and funds to expedite further research. The April symposium at which Kanzius got the key to Erie brought out 700 people who were not only enthused by the prospect of curing cancer, but having their city as the manufacturing hub of the device Kanzius invented. Former Erie Mayor Joyce Savocchio remarks, "I always say to John Kanzius, he'd better practice Swedish, because I honestly believe he's going to be in Sweden accepting the Nobel Prize!" Savocchio leads the fundraising efforts in Erie and says, since the machine would be built there, Erie cud benefit, big-time. "The projected income," she points out, "should this be successful, is anywhere between $2.5 billion and $10 billion a year." Experts say human trials using Kanzius' device are at least three years away, but Kanzius is undaunted, telling Schmidt, "I'd like to see the first patient treated wile I'm still alive, and to have the doctor tell them they're cured! As for Kanzius himself - Schmidt says his health is considered stable, and he continues to undergo chemotherapy for his leukemia.